L-R: Ambassador Constance Mitchum, Lady Mary Simmonds, Dr Sir Kennedy Simmonds, Senator Byron-Nisbett, Mrs Vernie Amory, Hon Vance Amory, and Mr Alex Nisbett. 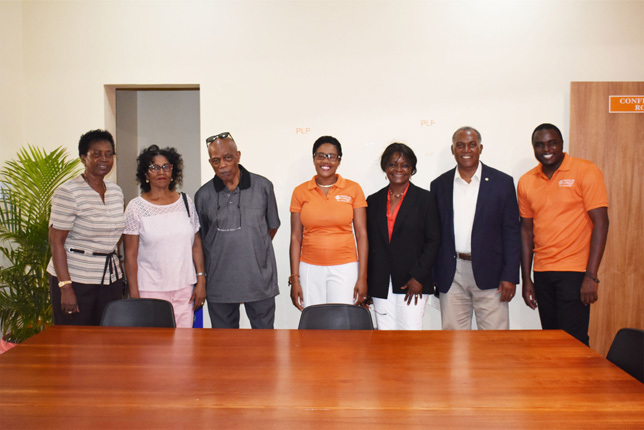 BASSETERRE, ST. KITTS, March 25, 2019 (PLP PR Media Inc.) — To ensure that the people of St. Christopher Three (West Basseterre) benefit from Team Unity’s Prosperity Agenda, Team Unity’s Caretaker in the constituency Senator the Hon Akilah Byron-Nisbett has feverishly been lobbying for them and on Saturday March 23 went a step further with the opening of a constituency office at Lime Kiln Industrial Park. The colourful ceremony was graced with the presence of Prime Minister, and National Political Leader of the Peoples Labour Party, Dr the Hon Timothy Harris who delivered the feature address. In his address Dr Harris praised Senator Byron-Nisbett’s parents, who were present, Mr Terence and Mrs Althea Byron for supporting their daughter. Others present included Senior Minister and Minister of Labour, Social Security, and Ecclesiastical Affairs the Hon Vance Amory, and Mrs Vernie Amory; Minister of Agriculture, Health et al, the Hon Eugene Hamilton; first Prime Minister and only living National Hero, the Right Hon and Right Excellent Dr Sir Kennedy Simmonds, and Lady Mary Simmonds; Ambassadors Constance Mitchum, and Sydney Osborne; Mr Tony Ross QC, who is a former People’s Action Movement (PAM) parliamentary candidate for West Basseterre; and Peoples Labour Party (PLP) Founder Member, Mr Antonio Maynard. Addressing the huge gathering at the parking lot of the CMR Building, which houses the PLP Constituency Number Three Branch office on the ground floor in Unit E, Senator Byron-Nisbett said as the Caretaker for the constituency she had listened to the people’s needs in the areas of lands, housing, roads and sporting infrastructure and having lobbied the relevant authorities, the people of West Basseterre are now seeing the fruits of her efforts. The office, she informed, will offer more than just access to their Caretaker. They will also be able to meet with the Leader of the Peoples Labour Party and Prime Minister of St. Kitts and Nevis, Dr the Hon Timothy Harris, who in 2015 had committed to the people of West Basseterre that he would be available to them. She added that Prime Minister Harris was a man of his word; one who says what he means and means what he says. She noted that the opening of the office was the realisation of his promise to the people of West Basseterre. The office, which will be open 9:00 am to 5:00 pm from Monday to Friday, will also serve the people of West Basseterre wishing to access government services. A fulltime secretary Ms Crystal Boyles, apart from making appointments for persons to have one-on-one meetings with the Caretaker, will also provide them with information on various offerings by the government so that they are kept informed.